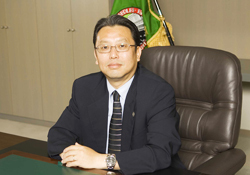 Company Profile "President's Message"｜ORGAN NEEDLE CO.,LTD. ORGAN NEEDLE CO., LTD. has always addressed technology development in a global market since we were founded as a manufacturer of gramophone needles in Tokyo in 1920. Now, the ORGAN brand is deeply trusted and greatly supported by our customers all over the world, not only in the fields of industrial and home sewing needles, knitting machine needles and felting needles, but also in the electronic and precision parts field where they are produced by our affiliated companies. We will continue to make further progress in technology, system and human resource development and we will truly be committed to ensure that our customers receive products with the innovations to meet their needs in the rapidly changing 21st century. Our never-changing corporate motto is “Each and every needle we make for our customers shall be handed over around the world in good faith”. Under this motto, we will continue to make efforts to build a better relationship with our customers through our quality products and services. COPYRIGHT© ORGAN NEEDLE CO., LTD. ALL RIGHTS RESERVED.